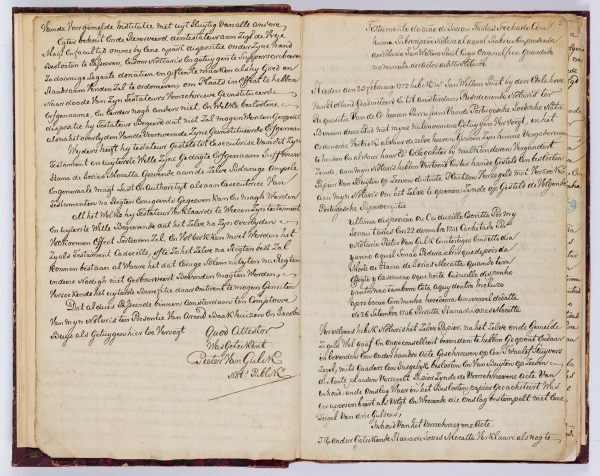 f. 1r-4v: Will of Josiau Tartas, written December 22, 1741. Text in Dutch and Portuguese. f. 5r-7v: Will of Hana de Josias Mocatta, who died in February 24, 1772, written in April 24, 1749. Text in Dutch. f. 8: List of the legatees and legacies of the wills of Hana de Josias Mocatta and Josiau Tartas (alias Josiau de Crasto de Paz). Text in Portuguese. f. 9r-36r: Summary of the legal case concerning the execution of Josiau Tartas’ will and other related documents. Text in Dutch and Portuguese. f. 37r-41v: “Escamoth da União das Res Keiloth a saber”. Regulations of the union of the three Sephardic congregations in Amsterdam. f. 41v-42v: “Termo da Rezolução que Tomarão os SS.res do Mahamad & Velhos da Nação pra o Redresso da Varios Pontos, para Suprir o atrazo da Sedaca”. Resolutions of the Mahamad and Elders of the Portuguese Nation to solve several problems related with the delay of the Sedaka, 1742.
f. 43r-46r: “Termo do Reporte que fiszerão os SS.res Cometidos aos SSres do Mahamad & Velhos da Nação”. Reports on the resolutions concerning the Sedaka, 1748.
f. 49r-50r: “Termo dos SS.res do Mahamad & Velhos da Nação para abulir a Pauta dos SS.res 12: Velhos Eleitos &.ª”. Resolution of the Mahamad and Elders of the Portuguese Nation to abolish the list of the twelve elected Elders, 1735.
f. 50v-53v: “Escamoth Gerais do K.K. de T.T.”. General regulations of the Kahal Kadosh of Talmud Torah. f. 55v-57r: “Reformulação das Escamoth da Santa Hebra de Bicur Holem”. Reformulation of the regulations of the Hebra. f. 57r-71r: Several ascamoth related with the daily life of the congregation (relations with Ashkenazim and goyim, tax payment, synagogue’s attendance, etc.) and other reports, petitions and decisions (e.g. : resignation of Joseph Abendana; herem against Moseh Hamis Orta, Jona Abarbanel and Moseh Belmonte, Daniel Rachão, Jacob Moreno and his wife; judgment against Abraham Baruch Franco). Text in Portuguese. 72r-74v: Several articles and resolutions in Dutch. f. 76: Loose folio with an extract of the ascamoth of the union of the three Sephardic congregations, 1639. Bequeathed by Rabbi J. Ferares of the Hague in 1885. Portuguese and Dutch / Paper / 32,6 x 19,7 cm. /  ff. / Variety of lines to a page / Two different current hands / No title / Modern half-leather binding. Fuks 393. Fundação Calouste Gulbenkian.